Today is a little different type of blog post. I’m going to write about a new Family Restaurant that opened today, 16 Feb 2016 in Merrimack, Hillsborough, New Hampshire. Portofino Italian Restaurant Just click on the link to see the amazing menu choices offered. 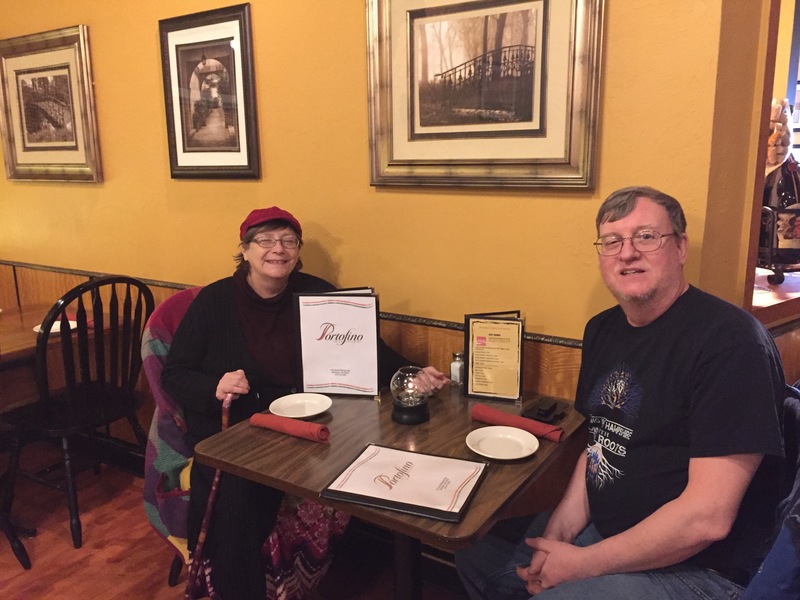 My husband, Michael D. Butka and I, June Stearns Butka, decided to visit if they were open. The opening was delayed until all permits were in order, like all new starting business. When we entered the doors we were greeted with a familiar face, Janet. Janet was a waitress at Florence’s Restaurant for 26 years. Her friendly, welcoming smile was a pleasant sight to see. She informed us we were their first customers. Right then and there I knew I would be blogging about this restaurant. Janet offered us any seat in the house, took our photo with Mike’s IPhone and gave us a brief overview of the menu. I looked around the restaurant to see what changes were made. I think the achieved a nice balance of the old and new personalities of the restaurant. Yes, there is one cork bottle wall, proudly presenting the outline of Itlay, boot and all. Come in and see the blending of the restaurants. We asked her recommendations, she introduced us to one of the new owners, Maria Mastantuono. Maria gave a delightful history of their food experience and a synopsis of the menu. Maria and her husband, Giuliano (the chef) are familiar faces to some of us in the Merrimack/Amherst area. They owned until last week, PastaAmore. I love the idea of supporting local businesses, families and giving them a shut out for the new adventure they are starting. Check out their website or their Facebook Page for menu and history. Mike posted our picture to the Merrimack Forum Facebook Page, within an hour there was 78 likes and multiple post. Several asking for a review of the restaurant. Here is my review as promised. I must state up front that my husband is the one who likes Italian food. I’m more of the local diner or Thai food person. Maria explained each of the main entree’s to us, including the fact that they have both fresh and dry pasta options. If you are not a meat eater, I found several choices to choose from. We decided that we would order appetizers to go; Meatball sausage side dish for Mike and Crab-Spinach Carciofi for me. Late night snack time. 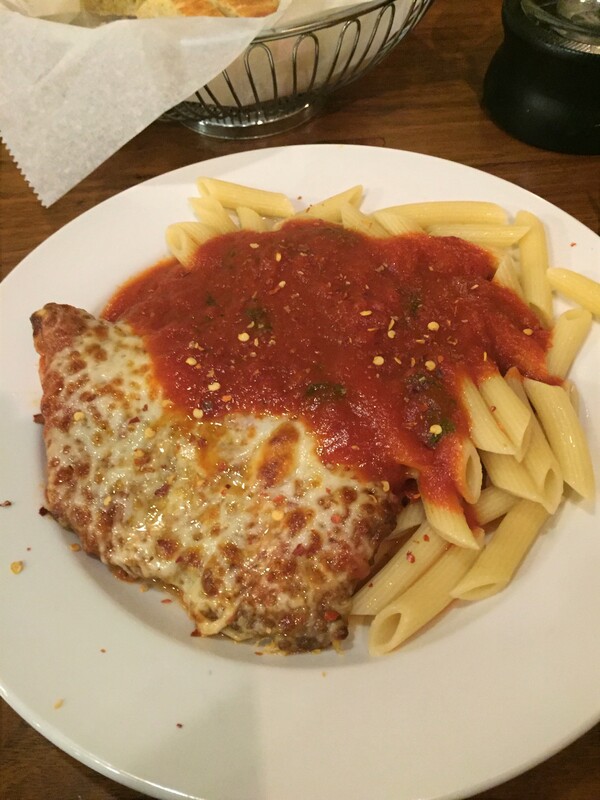 Mike choose to order the “Parm Lunch”- you had a choice of Eggplant or chicken smothered in Marina sauce and mozzarella cheese. Mike choose chicken over Penne Pasta. The chicken was tender and the Penne al-dente, just the way Mike likes it. 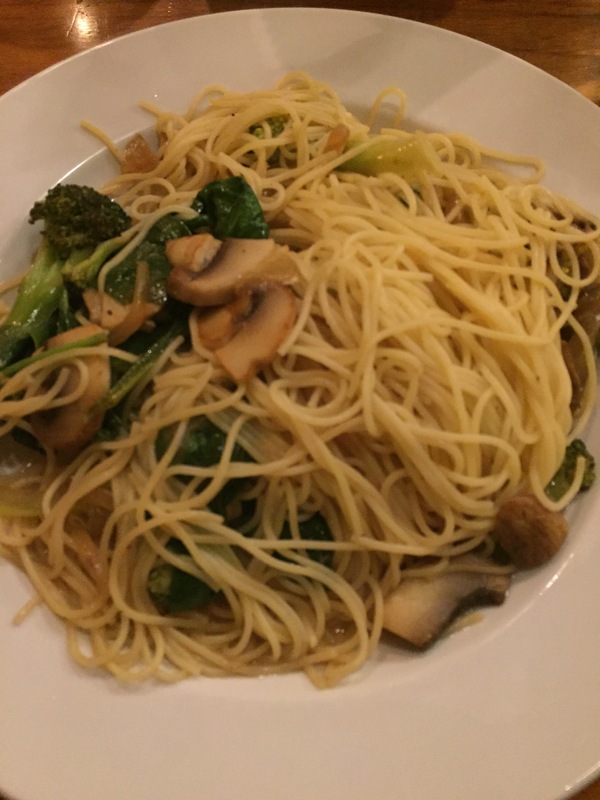 I choose Pasta Firenze with Angel Hair pasta with mushrooms, spinach, garlic, onions and broccoli in a white wine sauce. 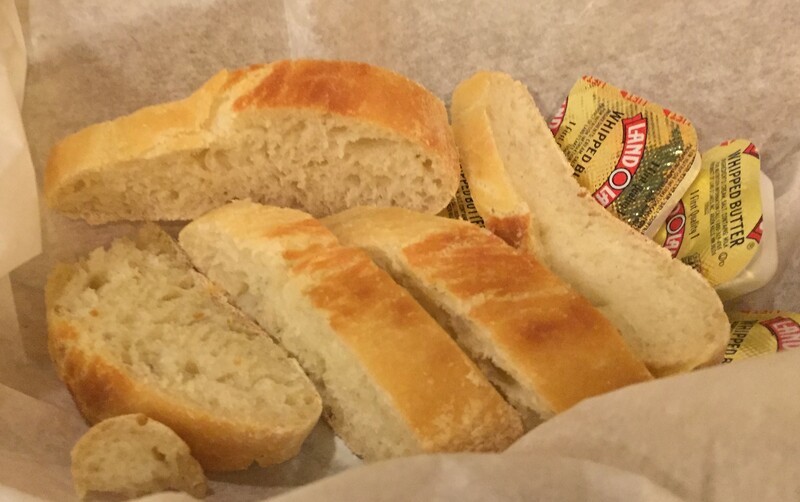 After ordering we were surprised with fresh made bread with a homemade spiced olive oil. Not too spicy, just enough to give a tingle. Did we do dessert? Oh, yes, we did. The two side menu provides a delicate and not so delicate palate choices for you. It was a very difficult decision. We started out thinking we would share one, just to sample something. We ended up both ordering. I can’t wait to go back and try the Lemoncello Flute or one of the sorbet offerings. I don’t think I need to tell you that Mike and I will be returning to Portofino’s again to sample more of their menu. Please remember the menu is new to Janet. Have patience, as with any new business, kinks need to be worked out. The friendly atmosphere, people and food are all worth the time and patience. Our food was served in a timely manner, hot or cold as it should be served with a smile and helping answers to all our questions. It is nice to have another lunch choice in Merrimack, New Hampshire to go to. I still have my favorite places to eat, but one can’t live on the same type of food all the time. After-all variety is the spice of life. 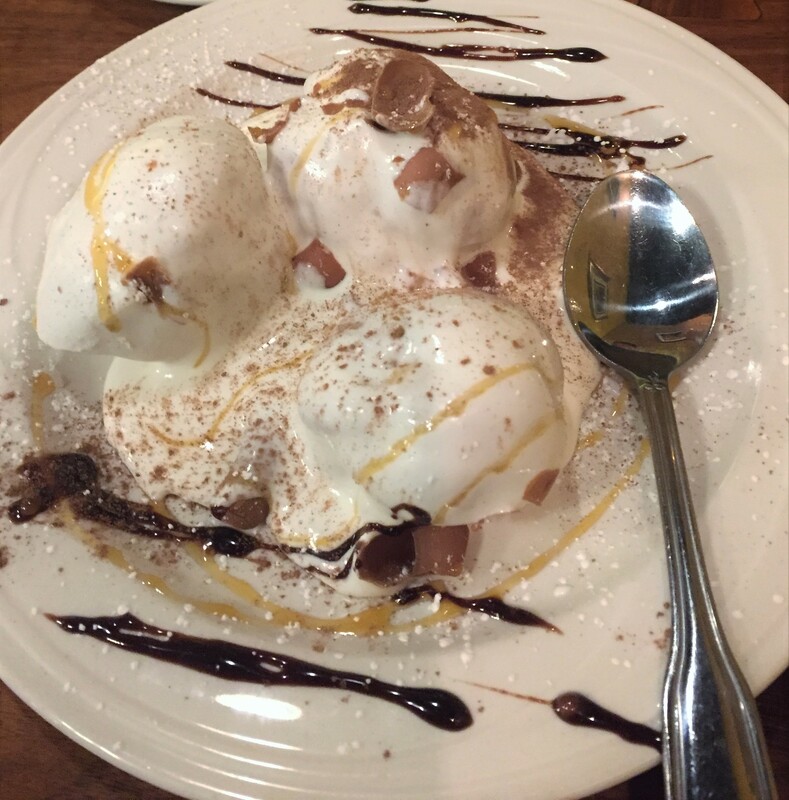 It looks delicious, June 🙂 Thanks for sharing your experience! Thank you. We enjoyed ourselves.